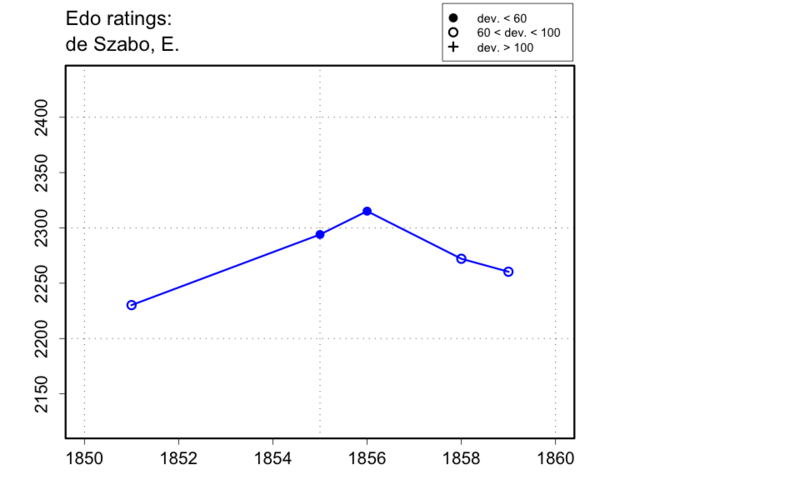 Edo Ratings, de Szabo, E.
Spinrad has 'Djuro Szabo' at Birmingham 1858 and La Grande Storia degli Scacchi has 'G. Szabo' at London 1851, and 'Djuro Szabo' at Birmingham 1858, but Gaige gives birth year for 'Djuro (or György) Szabó' as 1840, which would make him too young for London 1851 at least. La Régence has 'M. le colonel Szabo' in Paris in 1851, saying that he'd played at the tournament in London. Edgar indicates that Colonel Szabo became a member of the Liverpool Club in 1859. An obituary in the Liverpool Mercury (20 Apr. 1865) suggests that this was Colonel Emeric de Szabo (this last information from Alan Smith through a communication from Tim Harding).